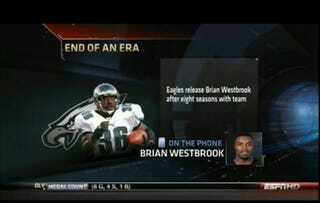 SportsCenter was so thrilled to get "Brian Westbrook" on the phone, they skipped a very important step: making sure it was actually Westbrook, and not a Stern disciple expressing his desire to worship Stern's prostate. Poor Scott Van Pelt. Nice guy, don't deserve this. But Captain Janks has fooled many a media outlet before, and it won't be his last. On the other hand, one producer might have some free time on their hands.